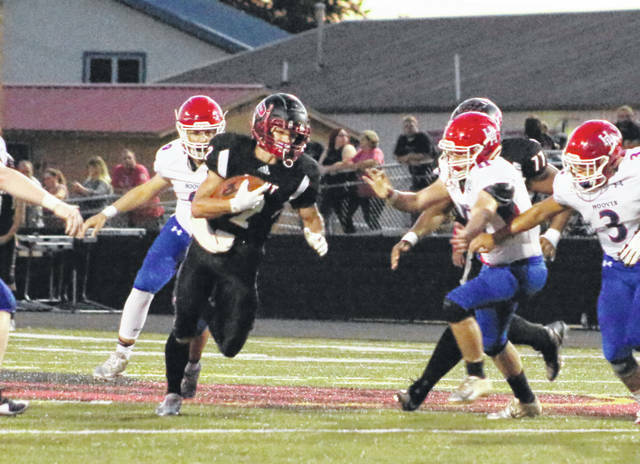 Point Pleasant senior Josh Wamsley (2) runs the ball past a handful of Herbert Hoover defenders during a Week 4 football contest at OVB Field in Point Pleasant, W.Va.
POINT PLEASANT, W.Va. — Maybe there’s a reason that the Cardinal Conference doesn’t want to bring them back. 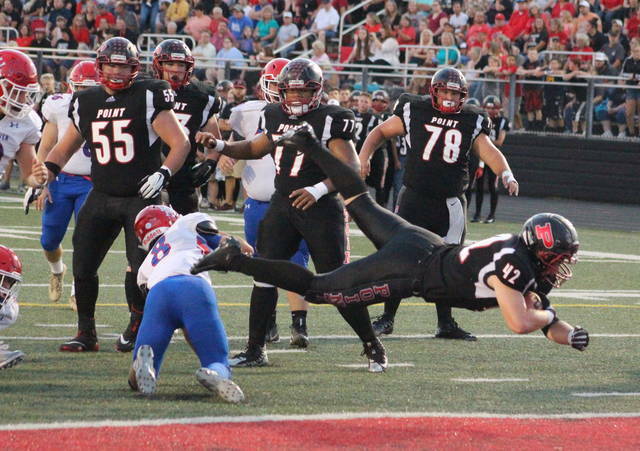 The Point Pleasant football team improved to 7-1 against its former league foes on Friday night following a resounding 53-21 Homecoming victory over visiting Herbert Hoover in a Week 4 non-conference contest at Ohio Valley Bank Track and Field. The host Big Blacks (4-0) scored the initial 32 points of regulation and amassed 327 yards of total offense in the first half en route to building a sizable 39-7 intermission advantage. 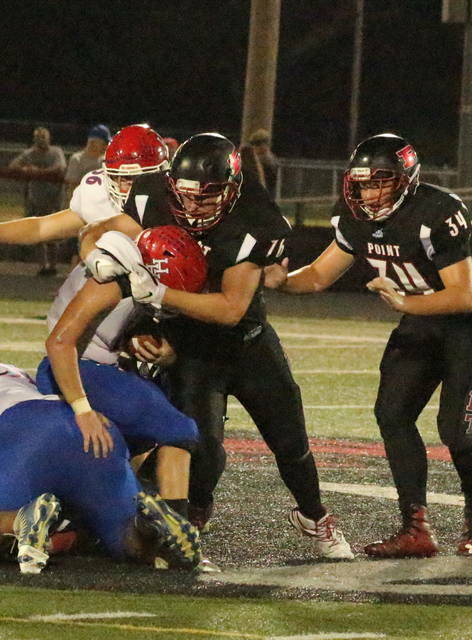 Both the Red and Black and the Huskies (1-3) traded touchdowns over the course of the second half, with Point Pleasant twice building leads of as much as 39 points. The Red and Blue added the final score with just under 10 minutes remaining to slow down a running clock, but the guests ultimately ran out of time on any kind of comeback attempt. The Big Blacks — who won the Cardinal Conference title outright in 2011 — had to leave the Class AA-based league in the fall of 2012 due to being bumped up to Class AAA. Point Pleasant has since won 7-of-8 outings against Cardinal Conference opponents, with the lone loss coming to then-defending Class AA state champion Mingo Central (36-34) on a Hail Mary pass in Week 1 of the 2017 campaign. PPHS — an original member of the Cardinal Conference when it was founded — has also re-applied and been denied access twice since returning to Class AA back in 2016. It was the sixth straight home victory for Point Pleasant, as well as the program’s seventh consecutive regular season win. Point has also secured a triumph in its last six Homecoming contests. On a night in which the hosts produced 336 of their 448 total yards on the ground and had three different players score a pair of rushing touchdowns, PPHS coach David Darst noted that his troops once again put together an offensive display of firepower. More importantly, the 12th-year mentor was also pleased with how his team is progressing headed into another big matchup seven days from now. “We thought the kids seemed a little distracted before the start of the game, being Homecoming and all, but they really woke up and came out ready to play,” Darst said. “Our offense was really clicking once again and I thought our defense played well for the most part, although we did seem to lose some intensity as the lead continued to grow. 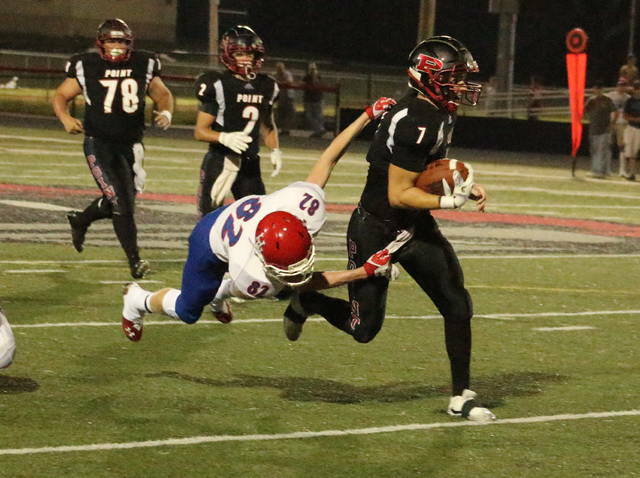 Point Pleasant averaged 12.9 yards per carry on the ground, with seven different backs producing double-digit yardage by night’s end. The Big Blacks also surrendered a season-high 213 rushing yards on 46 carries, an average of only 4.6 yards per tote. The hosts — who outgained HHHS by a substantial 254-79 margin in the first half — built a quick 19-0 advantage after 12 minutes of play. Nick Parsons barreled his way in from five yards out with 6:04 left in the opening canto for a 6-0 lead, then Brady Adkins added touchdown runs of six and 57 yards in a 2:32 span to end the quarter. Josh Wamsley then hauled in a 35-yard pass from Cason Payne at the 7:58 mark of the second for a 25-point cushion, then Parsons added a 17-yard scamper with 5:19 left before halftime for a 32-0 edge. The Huskies finally cracked the scoring column with 3:09 remaining in the first half as Ben Kee rumbled 15 yards to paydirt for a 32-7 contest. The guests, however, were never closer the rest of the way. Payne completed the first half scoring on a three-yard scamper with 1:37 left, giving the hosts a 39-7 lead at the break. Point Pleasant was plus-1 in turnover differential and also held a 13-5 edge in first downs at the intermission. The Huskies tried to get sneaky with the second half kickoff, trying an onside squibber that technically didn’t cover 10 yards. Christian Holland, however, quickly gathered the onside kick and returned it 47 yards to paydirt for a 46-7 advantage just eight seconds into the third period. Kee tacked on a seven-yard run with 4:18 left to close the gap down to 46-14, but Payne added the final Point Pleasant score on a 21-yard scamper at the 2:01 mark for a 53-14 advantage. Rhett White scored on a one-yard run with 9:56 left in regulation to wrap up the 32-point outcome. The Big Blacks claimed a 21-12 advantage in first downs, but did finish the night minus-1 in turnover differential. The hosts were flagged three times for 25 yards, while Herbert Hoover was penalized six times for 32 yards. Payne led Point Pleasant with 118 rushing yards on nine carries and also went 7-of-9 passing for 112 yards and one score. Adkins was next with 90 yards on six attempts, followed by Parsons with 34 yards on five totes and Hunter Bush with 34 yards on one carry. Wamsley led the Point wideouts with three catches for 70 yards, with Aiden Sang adding two grabs for 26 yards. Oliver Skeie was also 5-of-7 on PAT kicks in the triumph. Wamsley recorded an interception at the 3:25 mark of the first quarter. 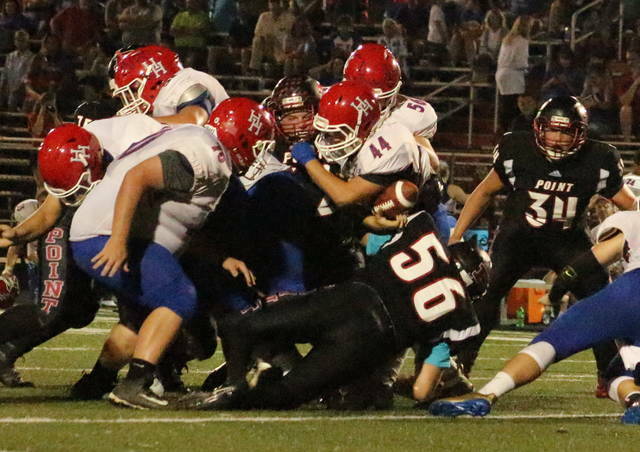 Nick Leport and Wyatt Stanley also had a quarterback sack apiece for the hosts. Kee paced Herbert Hoover with 198 rushing yards on 20 carries, with Dylan Kennedy following with 13 yards on six tries. Rhett White was 5-of-16 passing for 50 yards and threw an interception. Kee also led the wideouts with two catches for 24 yards. Point Pleasant completes a three-game home stand on Friday when it hosts Pikeville (KY) in a Week 5 matchup at OVB Field. Kickoff is scheduled for 7:30 p.m.